According to Pocket-lint Motorola just inked a deal with Microvision to produce a prototype of a cell phone with a laser projection unit built in. Folks are saying that while this is an innovative concept it is going to add a significant bulk to cell phones as well as such an added drain to the battery life that it won’t be worth while. I am taking an alternative view on this one. First off they say the prototype is probably at least a year away. 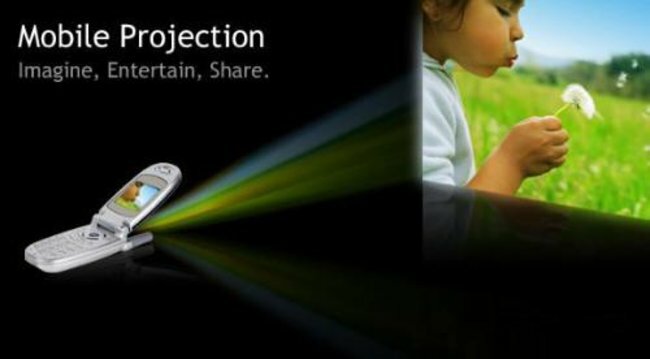 I foresee a smartphone, like the Motorola Q, bulked up a bit with this projector, replacing laptop PowerPoint presentations. Just sync up your presentation to your phone, attend you meeting and boom, instant projection, lightweight and mobile, no need to carry a bulky projector or laptop. Once this becomes integrated into business phones it will expand out to phones like the iPhone. No more watching movies on a tiny 3″ screen, just load the movie up and you have you own portable movie player. The possibilities that could arise from this type of device are pretty innovative and as phones become more specialized for both business and entertainment, this seems like a logical next step to help with that. To address the problem, I don’t foresee size being one of them. Phones are being scaled down and smaller chips are being produced at a rather fast clip, the current phones available on the market are the size they are because any smaller and you’d start having problems operating them. Battery life on the other hand is a different issue entirely. My current cell phone (the Moto Q) barely holds a charge for 20 hours with normal usage. My first phone could hold a charge for 3 days. Why is it that as phones get more advanced the batteries aren’t keeping pace? Anyway, you heard me say it here first, don’t listen to the naysayers, I am guessing by 2015 they will be pushing projector phones across the market.